Pepper & Joey were found abandoned outside in the same area as Julia and Bentley. 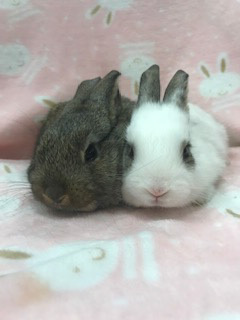 These two darling bunnies are approximately 5 weeks old as of 2/2/2019. 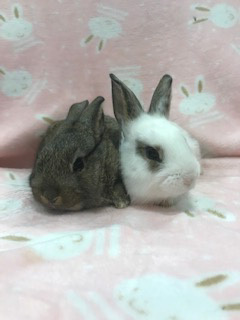 Pepper & Joey will be available for adoption at 8 weeks of age with a deposit at our next adoption event on March 2nd from Noon to 4:00pm at Petco 855 East Bidwell Folsom, CA. 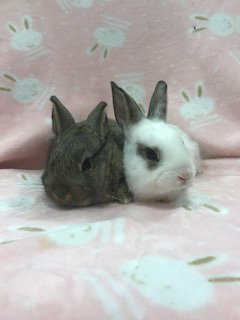 The deposit will be kept until the rabbits are altered by one of our contracted exotic Vets. All interested adopters will be screened prior to adopting. We do not adopt rabbits for children. Children often lose interest in pet rabbits. Rabbits have very delicate skeletal systems and should not be handled by young children. Children tend to want to hold and cuddle animals, most rabbits do not like to be held. Rabbits are NOT a low maintenance pet. They live an average of 10 to 12 years. We are looking for long term committed homes who will provide a loving indoor home for the life of a rabbit(s). Please note: we do not consider the barn, garage or a laundry room as adequate indoor housing for a rabbit. Indoor housing is a rabbit living in room of a home where the most activity takes place. Rabbits are very social animals and love to be part of the family. Before considering adopting a rabbit, research how to properly care for one. Check out our rabbit care articles here. For more extensive information on rabbits please check out Rabbit Care articles from House Rabbit Society.